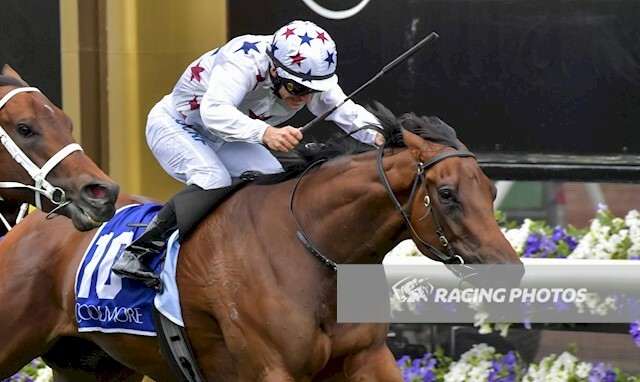 Champion filly Sunlight proved herself a courageous superstar beating the colts in the Group 1 $1million Coolmore Stud Stakes (1200m) at Flemington on Saturday, November 3. After trailing the speed, Sunlight ($5.50), the only filly in the race and ridden by Luke Currie, took the lead over the final 200 metres and withstood the challengers to score a half-neck win over Zousain ($3.40 fav) with Lean Mean Machine ($10) a length away third, all placegetters being by boom stallion Zoustar. McEvoy said it was sweet vindication for tackling the Coolmore after saying the filly should have won the Manikato Stakes at her previous run. He wasn’t hearing any excuses from the beaten brigade of colts. “They all had their chance to beat her,” McEvoy insisted. “Sunlight did it pretty much from the front in her normal manner. She was very courageous, and she is a star. “I understand the measure of what this race can do for a colt, I certainly get it, but when you have got a filly like this why not have a crack? “It just showed if she had the luck last week, she would have won the Manikato. It was a big call to take these colts on with this filly, but I’ve got such faith in her and she was there for the fight today,” he said. “She’s a courageous superstar. I couldn’t be more proud of her. For Currie, the win was a major breakthrough. “I don’t think I have ever ridden a winner on Derby Day so to do it in the Coolmore is pretty exciting,” he said. “She flew out today. I wasn’t sure whether I’d ride to lead Written By or he’d lead us. Sunlight became the first filly since Nechita in 2012 to win the Coolmore. Her win continued the proud Zoustar tradition in the Coolmore. Zoustar won the race himself in 2013 and his father, Northern Meteor, won it in 2008. Northern Meteor’s sire was breed-shaping stallion Encosta De Lago, who won the then Ascot Vale Stakes in 1996.